Elegant and timeless, cedar roofs bring instant sophistication to your home. But there are many types of cedar wood, and it can be difficult to determine which one is the best choice for your project. In this guide, we've laid out the specific characteristics of the most popular cedar woods, including their individual properties and history, so that you can find the perfect type of cedar for your design. What Makes Cedar a Great Roofing Material? Natural Beauty: Cedar roofs have a natural and elegant beauty. As the wood ages, it turns a lovely gray-silver that enhances curb appeal and continues to add visual interest, long after the roof has been finished. Withstands Storms: Cedar shakes and shingles can withstand hurricane-grade winds, stormy rains and heavy snows. This makes them popular choices for homes in the Caribbean and the southern United States. Energy Efficient: A natural insulator, cedar can keep your home cool in the hot summer months and warm in winter, significantly reducing energy expenses. Sustainable: An eco-friendly roofing material, cedar is both renewable and biodegradable, making it an environmentally conscious choice. Insect and Rot Resistant: The natural oils in cedar wood give it more than an attractive aroma. Acting as preservatives, they give cedar a natural resistance to UV rays, moisture and insects, and help to prevent rot. Beyond its decorative appeal, cedar is a practical roofing material — durable, efficient and aesthetically pleasing, a cedar roof is both a smart and beautiful choice. When it comes to roofs, there are several types of cedar to choose from. Cedar comes in three natural colors — red, yellow and white — although there are nearly endless options with stains. Next, we'll cover the history and properties of these three types. Abundant and versatile, western red cedar has earned its place as one of the world's finest softwoods. Indigenous to the Pacific coast of the United States and Canada, western red cedar is a slow-growth timber and thrives in the shady, wet and cool environments of northwestern forests. These cedars can reach gigantic proportions — some trees have topped out at 200 feet tall with trunk diameters as wide as 13 feet. The western red cedar has deep cultural significance for many indigenous North American cultures. For thousands of years, the native people along the Pacific Northwest coast used the western red cedar for a multitude of purposes. They used the bark to make clothing, blankets, rope and baskets, and they crafted the logs into long canoes, ceremonial masks, elaborate totem poles and community longhouses. Villages used long slabs of outer bark for roofing materials and prized the wood for its natural water-repellant characteristics. Researchers have discovered western red cedar artifacts dating from 3,000 to 4,000 years old. The spice-scented foliage has medicinal properties, and people have used it to treat common ailments such as rheumatism and colds for centuries. At the turn of the 20th century, the rest of the world began to catch on to the beauty and versatility of the western red cedar, and the wood began to be exported around the globe. Now, you can find western red cedar in international structures including the ethereal Welsh Assembly building. Decay Resistant: Western red cedar is continuously ranked as a highly durable and rot resistant, and it has one of the longest lifespans of North American softwood trees. Abundant and Sustainable: The most abundant cedar species, western red cedar is cost-effective and can be harvested sustainably. Dries Easily: Once cut, western red cedar dries easily with minimal shrinkage. Straight Grain: The straight grain texture of western red cedar makes it ideal for most building projects, from siding and shingles to furniture and decks. Stains Well: While western red cedar wood is naturally beautiful, it doesn't contain pitch or resin, making it a good receiver or stains and finishes. Light, durable and beautiful, western red cedar more than deserves its place as one of the most important timber trees in the Americas. Western red cedar is known for its rich and crisp aesthetic. The exact color of the wood varies, even within the same tree — some western red cedar is a light yellow-gold, while other trees yield a rich, deep brown wood. The heartwood of the tree retains the blushed-red tone characteristic of cedars. When used in shingles and shakes, western red cedar adds warmth to a building. The natural appearance contributes a welcoming atmosphere, and depending on the design, western red cedar can give a traditional or contemporary feel to a project. This aesthetic versatility is one of western red cedar's most appealing characteristics. If used for interiors, knotty grains can bring a rustic charm to a space. But if clear-grained pieces are used for roofs or ceilings, the wood creates an instantly urban and chic atmosphere. One thing is certain — western red cedar ages well. Although design trends change every year, western red cedar gives a warm and timeless look to a space that will last through decades of style evolution. This tough, slow-growing tree is the hardest known cedar species in the world. Alaskan yellow cedar is not a true cedar, but actually a member of the cypress family. However, the wood retains many of the advantages of true cedar, and it continues to be a popular construction choice. Also called the Nootka Cypress, Alaskan yellow cedar is smaller than its western red cousin — Alaskan yellow cedar trees typically don't grow much taller than 120 feet. But Alaskan yellow cedar is much denser than other cedars, and at least one-third heavier than western red. Alaskan yellow cedar is most abundant along the Pacific Northwest coast, ranging from Alaska through Canada and into America's northwestern states, especially Washington. Yellow cedar is capable of living for centuries, and some documented trees are over 1,000 years old. Like the western red cedar, yellow cedar held cultural significance for many indigenous societies along the Pacific coast, and culturally modified trees can still be found today throughout the old forests in Alaska and British Columbia. Due to its exceptionally straight grain and strength, Alaskan yellow cedar is one of the best materials for wooden arrow shafts in the world and was a common source of weapons for native cultures. Currently, yellow cedar is shipped around the world for a variety of construction needs, including boat building. Yellow cedar has the toughness characteristic of all cedar wood, and it contributes some unique advantages to construction. Strength: When dry, yellow cedar is considerably harder and stronger than most other softwoods. It can bear load impacts without forming ridges and doesn't splinter. Durability: Resistant to insects and harsh weather, yellow cedar wood is used extensively in exterior projects. Moisture Tolerant: Yellow cedar wood is full of decay- and moisture-resistant oils, which extend the lifespan of the wood in harsh-weather climates. Fire Resistant: The same oils that make yellow cedar wood resistant to moisture and rot also give it a natural fire resistance. Workable: Easily workable, yellow cedar can be formed into a wide range of shapes and can suit many different applications, from carpentry to joinery. If you choose yellow cedar, it will bring incredible strength, resistance and workability to your project. When cut, Alaskan yellow cedar has an attractive, uniform yellow coloring. However, as it ages, it weathers into a soft, silvery gray. This color transformation adds interest and sophistication to building projects — a yellow cedar roof gets more beautiful as it ages. Because it has a short growing period, yellow cedar wood is marked by distinctively thin growth rings. This gives the wood a medium to fine texture and a clean appearance. Free of resins, Alaskan yellow cedar takes a variety of stains and finishes, although many designers choose to stick with the wood's original color to take advantage of the lovely aging process. Smaller than western red and yellow cedar, eastern white cedar provides an exceptionally light and fine-grain wood. Also called northern white cedar and swamp cedar, these trees thrive in eastern Canada through the central and eastern forests of the United States. Dwarfed by their taller western red cousins, white cedars only reach 30 to 60 feet tall. Often, their trunks only grow to be 2 feet wide. Long-lived and sustainably harvested, white cedar is an especially attractive choice for roofing. Used extensively by the indigenous cultures, white cedar also gained a deep significance with European settlers. In the 16th century, French explorer Jacques Cartier wrote about a miracle tree, "arborvitae," that was shown to him by the native Wabanakis and Iroquois. This "tree of life," the white cedar, had foliage naturally rich in vitamin C. It proved to be a successful treatment for scurvy, a disease that plagued many sailors. Besides its healing properties, white cedar is less dense than other cedar trees and is excellent in applications where it is exposed to water and soil. Historically, this meant that white cedar was a natural choice for watercraft such as canoes, as well as for weather-tolerant fencing. In colonial settlements, white cedar was even used for piping, and some old cities still have cedar pipes weaving below cobblestone streets. Lightweight and finely textured, eastern white cedar wood is a lovely and efficient building material. Durability: Like the other cedars we've covered, white cedar wood is resistant to decay and naturally repellent to insects. Attractive Texture: White cedar wood has a dense, fine texture with an even grain pattern. Lightweight: White cedar is one of the softest and lightest woods available commercially in the United States. Customizable: Naturally a light, neutral tone, white cedar wood can be stained to almost any color or finish. Excellent Insulation: White cedar wood provides excellent insulation, which makes it attractive both in interior designs and exterior roofing. White cedar wood gives a natural beauty and strength to any building project, especially in outdoor structures. Eastern white cedar is popular for good reason. When used in interior design, the light wood gives off an interesting and welcoming scent and provides excellent insulation and acoustics. The outer layers of sapwood are white with a hint of yellow, and the inner heartwood is a pale brown with occasional red tones. The fine, dense texture of white cedar wood gives it a uniform, neutral tone and color. As shingles, part of white cedar's appeal comes from this pale color — it can take almost any stain, paint or bleach, so you can customize it to perfectly suit your project. Like yellow cedar, white cedar turns an elegant gray quickly when exposed to the elements, and continues to add visual interest as it ages. Cedar wood provides natural durability and strength and is a beautiful choice for roofing. Both cedar shingles and shakes make long-lasting and visually-appealing roofs. Below, we've listed five types of structures that could benefit from the elegance and stability of a cedar wood roof. Beachfront Homes: Cedar is naturally water resistant and can withstand the wear-and-tear of beach storms. To create a stunning look for your seaside residence, consider topping your building with cedar shingles or shakes. Cottages: Modern cottages combine rustic and timeless charm with a clean-cut design. A cedar roof gives a cottage a clean, modern upgrade while retaining the whimsical and cozy appeal of traditional cottages. Current trends like the Cotswold cottage are taking advantage of customized cedar shingles to create a unique and soft roof. Storybook Homes: Cedar shakes and shingles perfectly complement the steeply sloped roofs and soft, rounded edges of storybook homes. Choose a graying wood such as yellow or white cedar to add depth and interest to an already interesting storybook roof design. Upscale Private Residences: Cedar gives your home unmatched sophistication and adds effortless style to any upscale residence. National Park Buildings: Unlike many composite shingles, cedar wood is a sustainable and eco-friendly resource, and blends perfectly with the natural beauty of a national park setting. Simultaneously rustic and lavish, cedar roofs lend warmth and artistic flair to structures in a national park. Of course, this is just a small sampling of the many applications of cedar roofs. Whatever type of cedar you choose for your project, you know you will get a stunning, highly durable and weather-resistant roof for your home. With over 40 years of experience, the Custom Shingles team is the premier provider of artisan wood shingles. We specialize in helping you make your dream designs a reality, and we work with architects, builders and homeowners to create beautiful roofs that will continue to impress for decades. 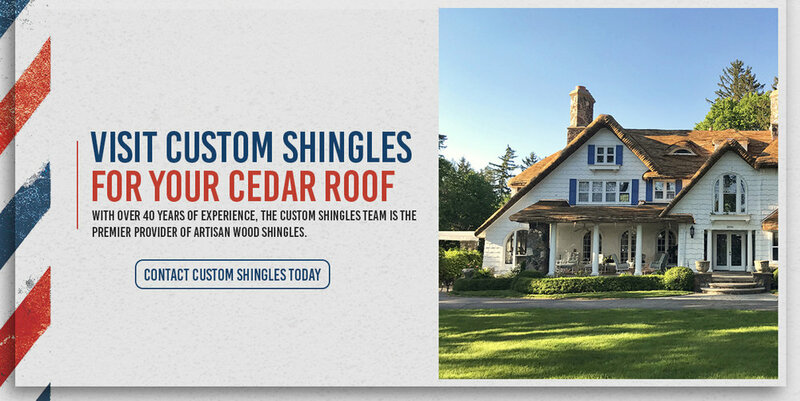 To learn more about the three types of cedar and cedar roofing, contact Custom Shingles today and get a free estimate and consultation. We do more than deliver premium products — we provide a superior experience, and will walk with you through every step of your roofing project. We look forward to working with you.